The Google Assistant was exclusively introduced with Google’s Pixel line devices in the later 2016. Well, that exclusivity was just for a couple of months as we have seen Google pushing the Google Assistant to most of the devices running Android 7.0 Nougat and later. As the Google Assistant overhaul was a server side switch, most of the users were struggling to receive the same. To help you get Google Assistant enabled on your device, we have also posted a few workarounds to enable GA immediately.Well, not everyone is a fan of Google Assistant. If you are someone who loves the old text-based Google Search like us, then we have a good news for you. Although Google has made it so hard to get back the Google Now, there are a few ways to port it. Today, we have come with another such workaround that will help you get the same. So, let’s just quickly begin our workaround. The workaround will not harm your Android device, neither it will remove the Google Assistant. It won’t bring back the text-select feature from Google Now on tap. However, you can do the regular Google searches easily from anywhere. You just need to install a few app. If you’re cool with that, you can scroll down to the tutorial below. This method requires us to install the two apps. Namely, the ‘SearchBar Ex’ app by devhomc and the ‘All in one Gestures’ app by YS Liang. The method has been tested on Moto G4, Moto X play, Samsung Galaxy S7, OnePlus 3, OnePlus 3T and it worked perfectly fine. Now let’s begin the procedure. The very first thing you need to do is, install the SeachBar Ex app by devhomc. 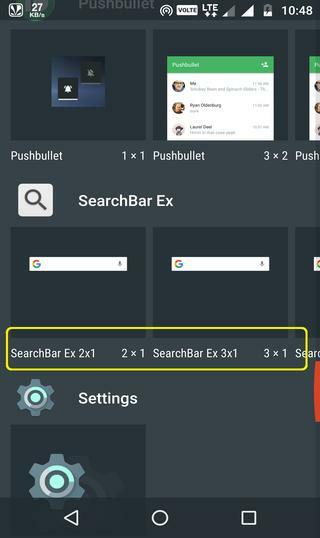 The SerchBar Ex app is really cool and it provides you features like- search widget, edit search engines, swipe gestures, voice search etc. The full features are as given below. Once you install the app, the next thing you should do is to customize the widget to get a proper Google Now experience. Here’s how you can do it. This is the first thing you should do after installing the app. 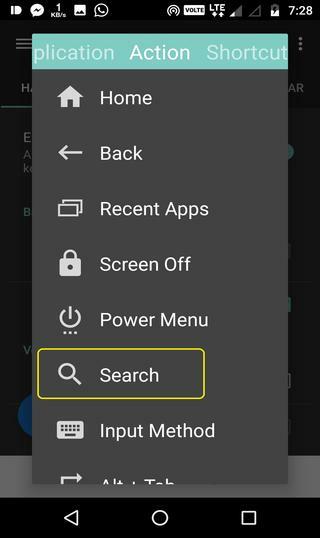 To do so, go to the widgets options on your Home screen> scroll down to the particular widget>select widget size as per your preference. The widget should look like this on your Home Screen. The swipe gestures are nothing but action based commands that allow you to quickly perform specific tasks based on specific actions. 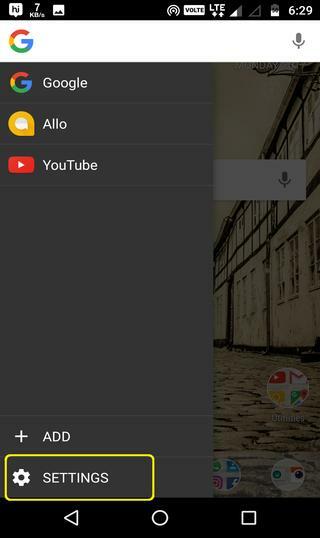 For instance, swipe left to open Google search, swipe down to copy, paste or cut, etc. To do so, go to the widget> action settings> then set gestures from the quick action options. 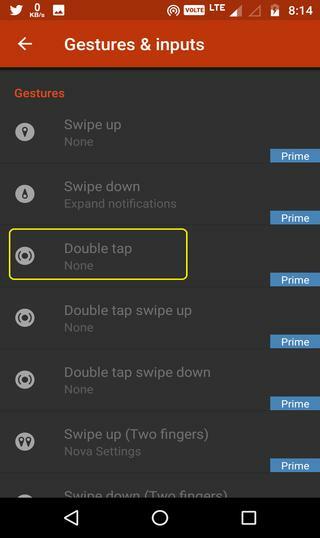 The actions include Tap, Long Tap, Swipe down, and Swipe left respectively. You can just tap on each button and set it to perform a specific task accordingly. The ‘all in one gesture’ app is another app that allows you to set a variety of gestures on your device using the hard keys or buttons. For instance, the hard keys include- back key, volume up and volume down. 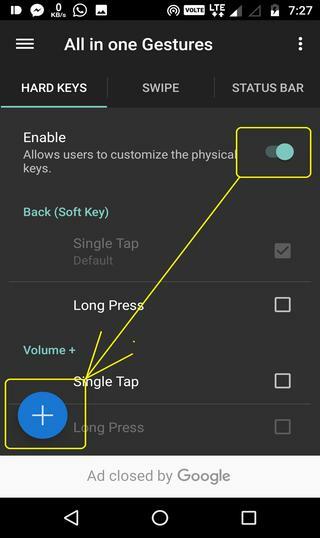 While the swipe keys include swipe based actions on your screen. However, we just have to configure the hard keys to fire the text based google search. 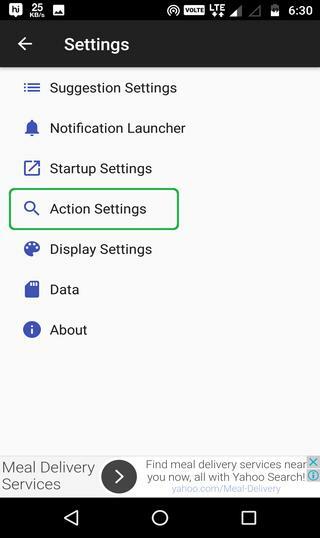 When you open the app, you will see three options in the app menu viz. 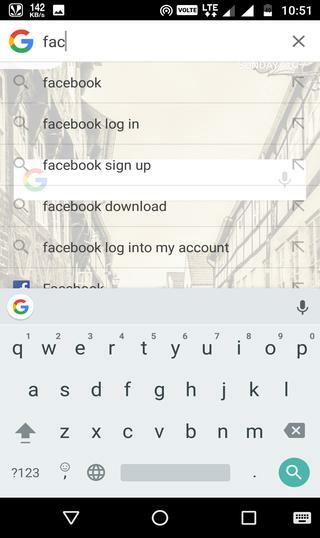 hard keys, swipe, and status bar. Now, the next step is to hit the add button(+ button) in the bottom left corner> select add Back(Soft key) and press okay. 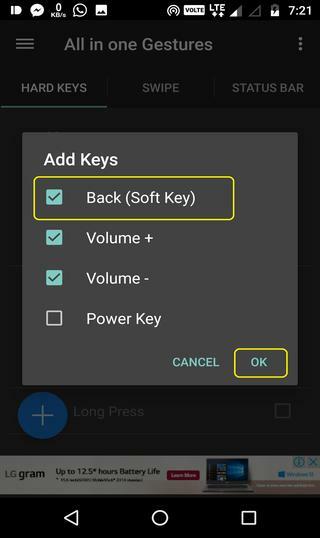 This will add a back button in the hard keys list. Now we just have to configure it. 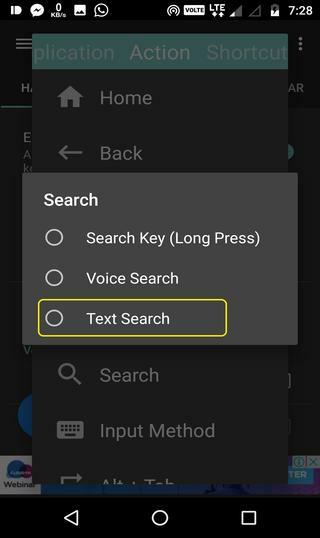 Now, find the back button in the list and tap “long press”> select the search option> and Assign a “text search” function to the back button. 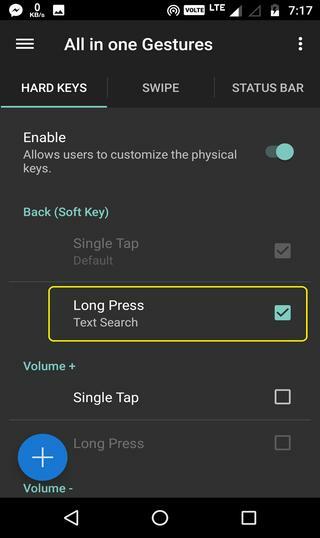 Now you can fire up the assistant with long-press of the home button and the regular text-based Google search on the long-press of the back button. 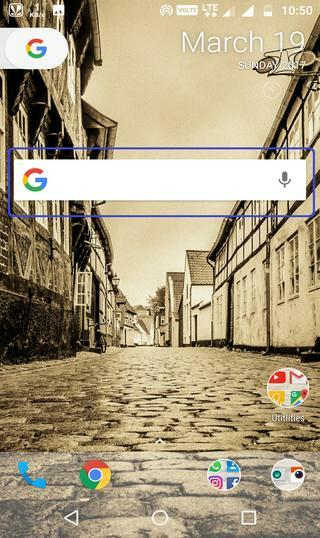 Installing the Nova launcher is also an alternative method to access the old text-based Google search. 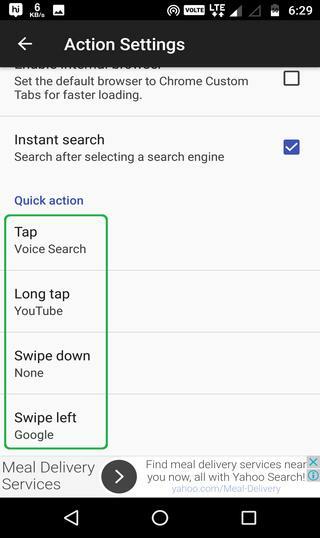 Simply go to the nova settings> gestures & inputs> set the double tap gesture to Google Search or Google now or whatever gesture you aren’t already using. 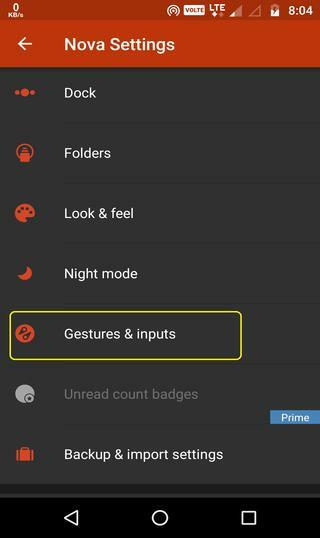 For that, you need to have Nova Launcher Prime.